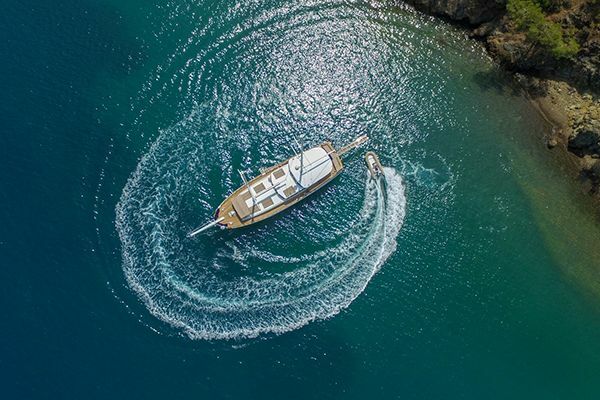 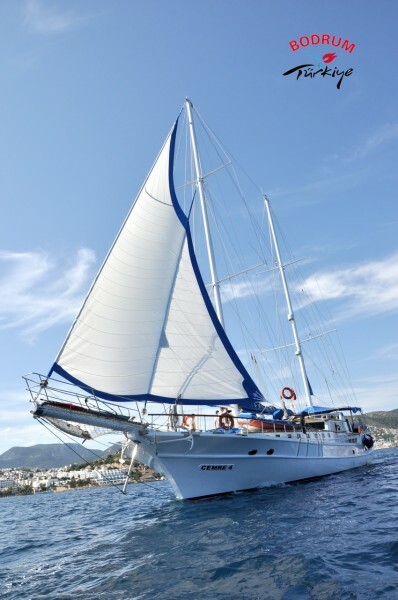 Large groups of up to eighteen guests will find the Cemre 4 gulet just right for their gulet charter holiday on the Turkish Aegean coast, or across to the nearby Greek Islands of Rhodes,Symi and Kos. 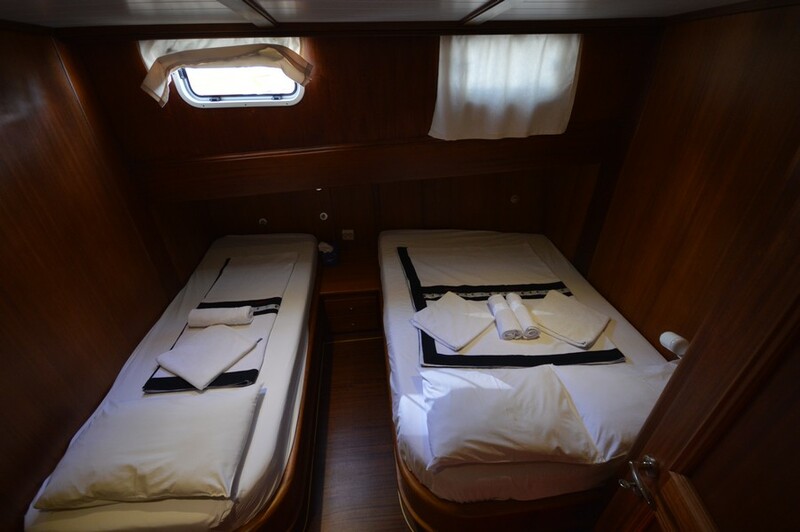 The one master double cabin, six double bed and two double+single cabins, will meet most groups’ needs for accommodation. 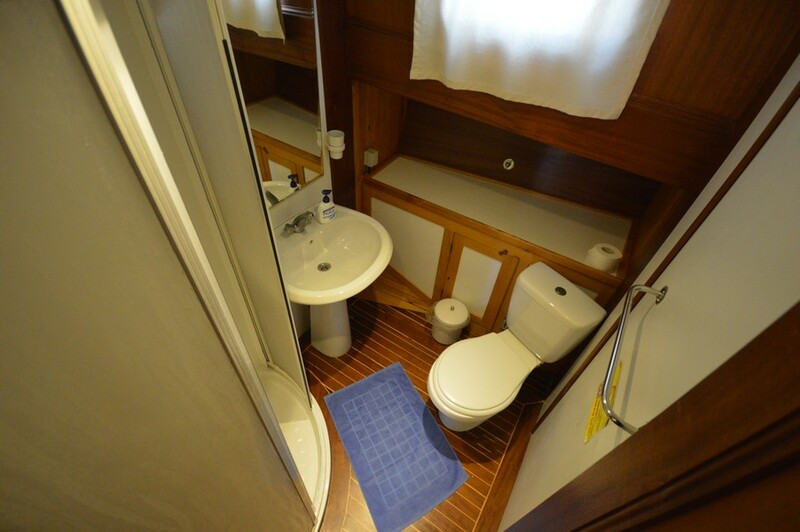 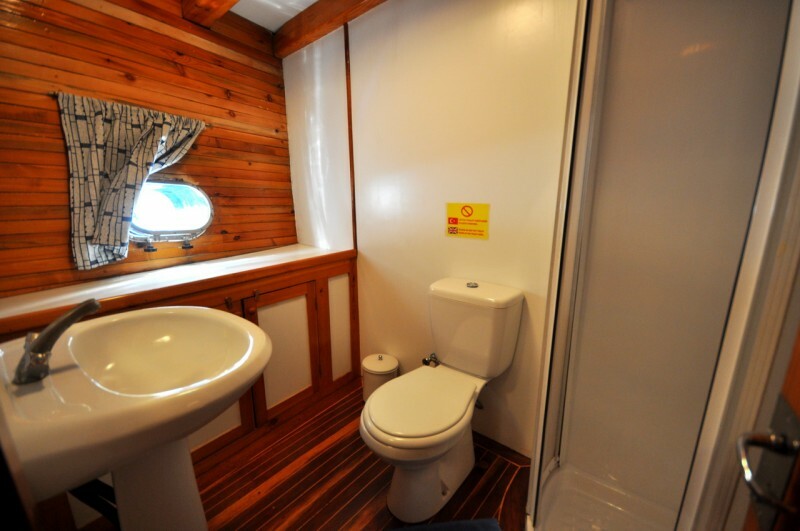 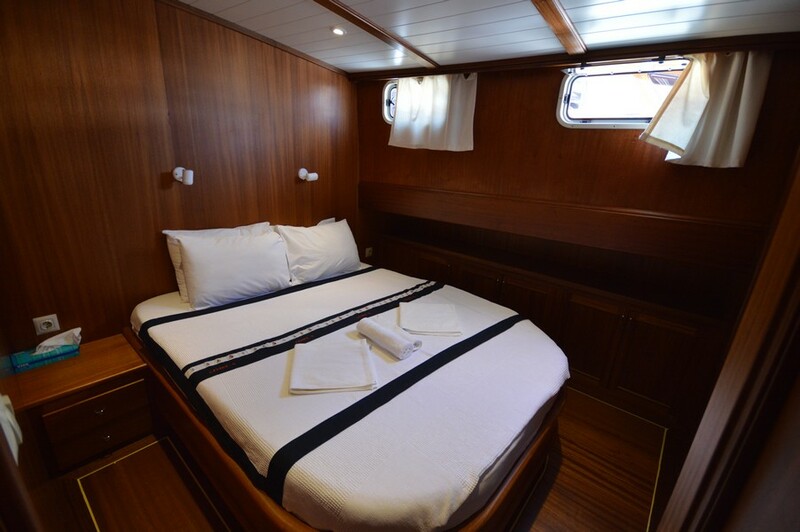 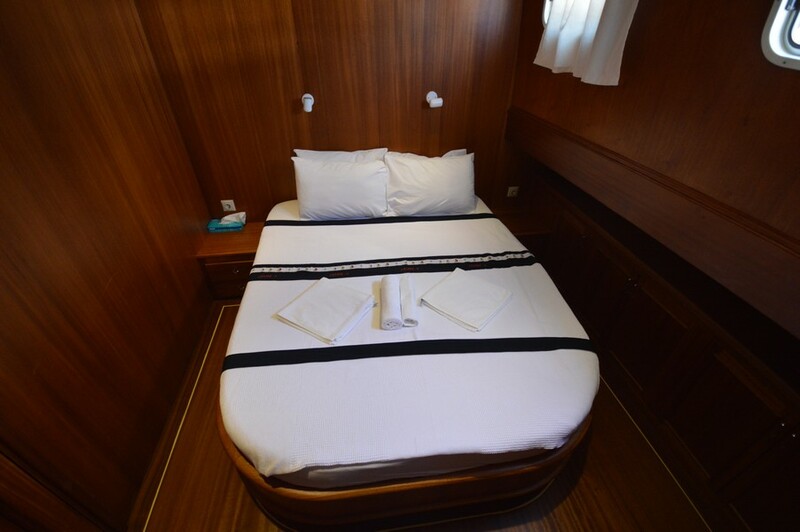 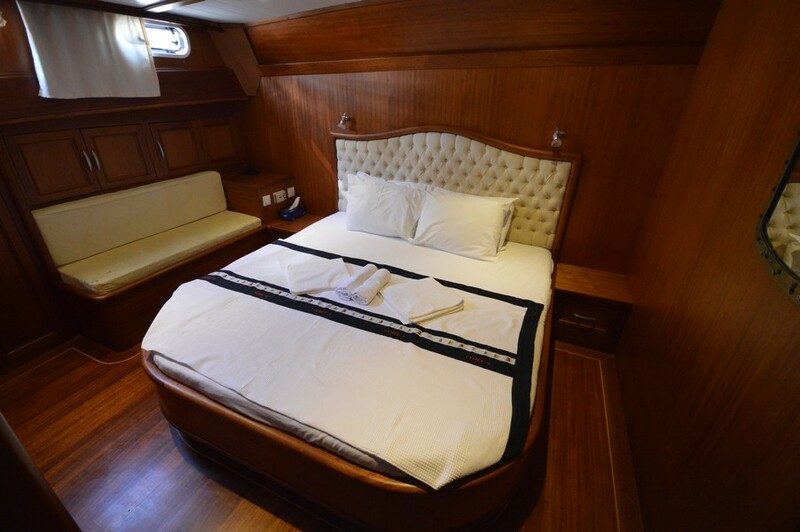 The guests’ comfort is ensured with air conditioning and en suite bathrooms in the well designed timber lined cabins, and an abundance of lounging space up on deck. 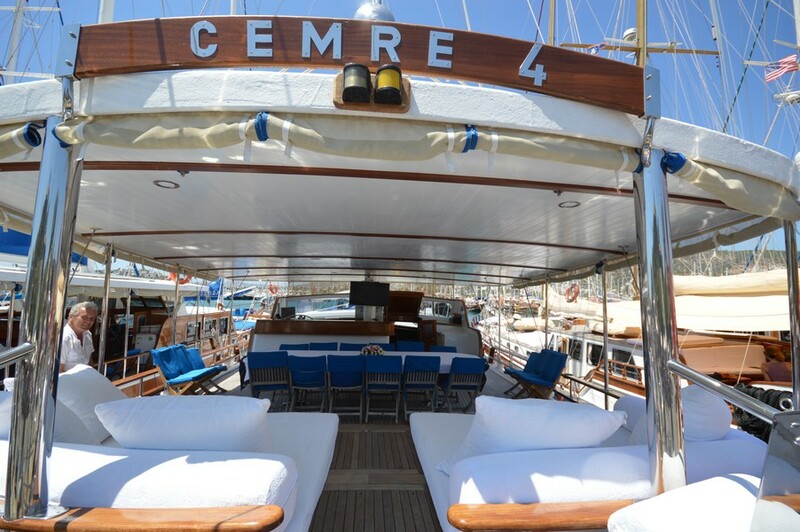 The fore deck has a generous bank of sunbeds plus an inviting arc of cushioned seats in the bow, perfect for sunbathing, conversations, quiet reading or pre-dinner drinks for all. 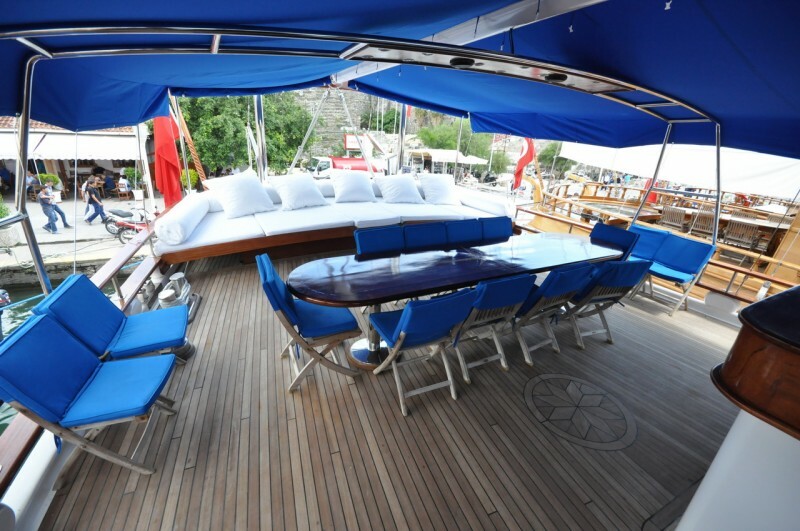 Dining on delicious menus prepared by the chef is a delight when sitting outdoors on the aft deck beneath the awning. 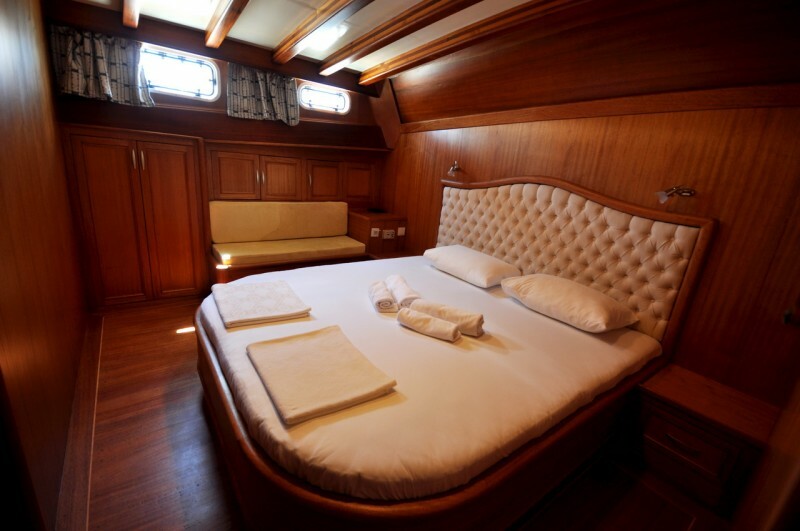 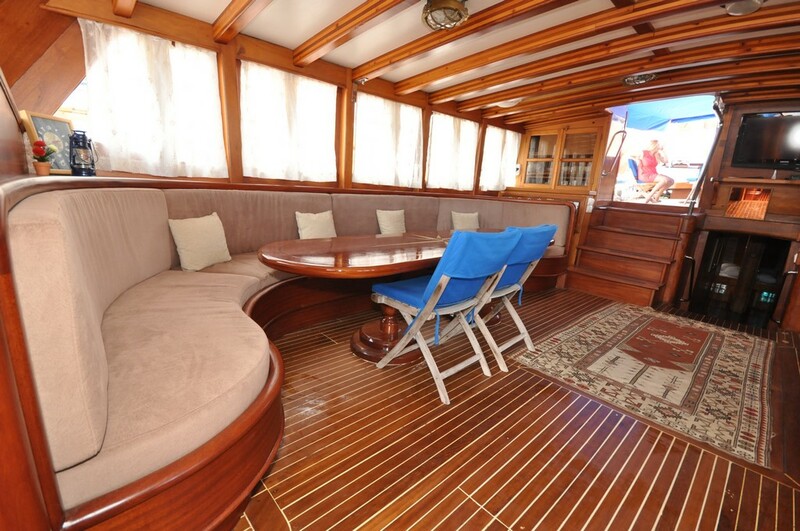 Across the stern is an inviting padded lounging area complete with extra cushions. 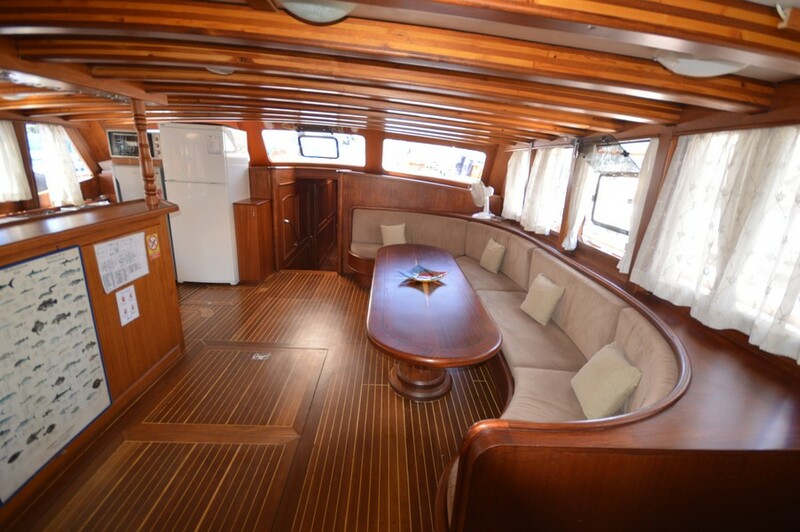 For an alternative meal there is also the indoor table and seating in the comfortable and air conditioned saloon. 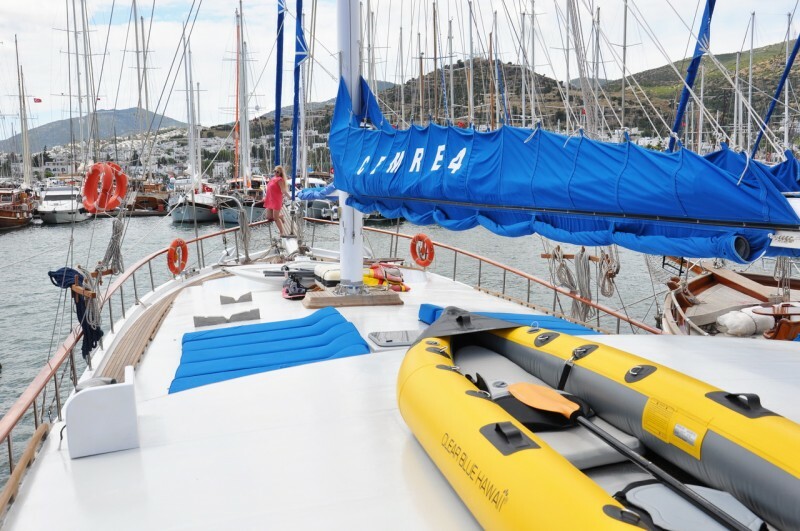 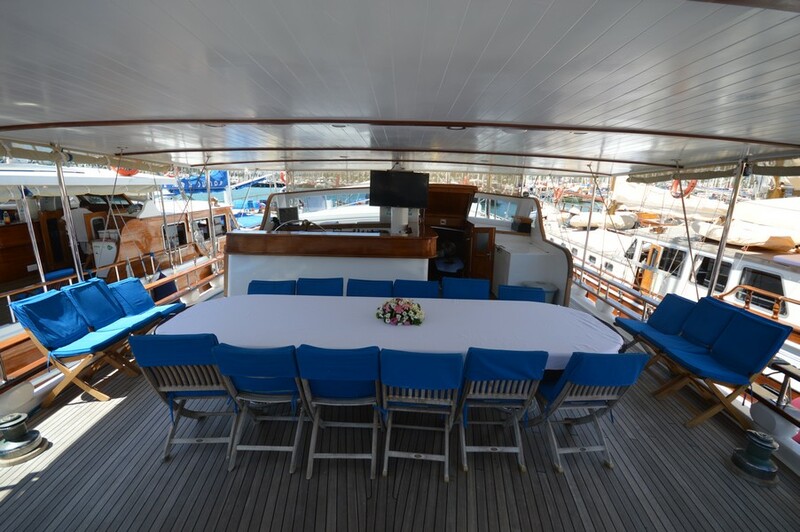 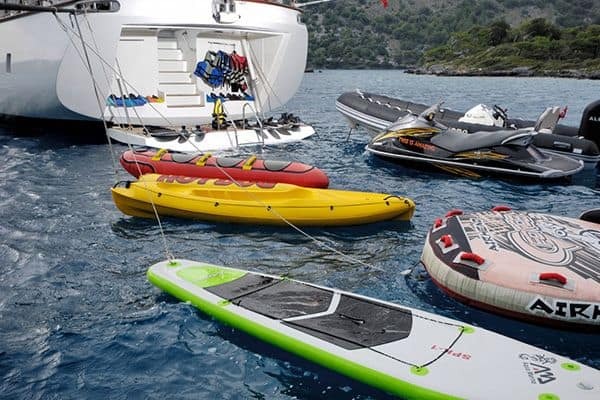 The saloon has all the entertainment essentials such as TV/VCD, and music systems, while on deck the active guests will find canoes, windsurfer, ringo and banana watertoys ready for great play in the water. 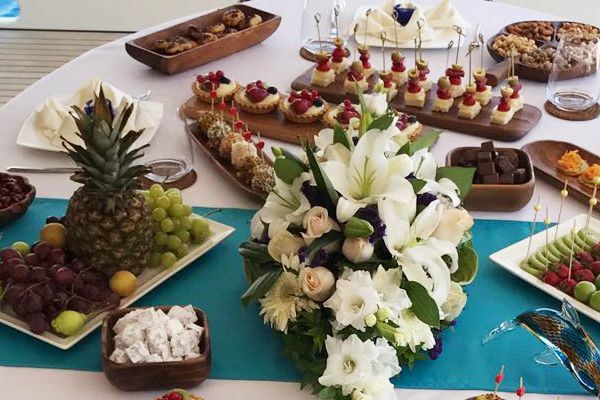 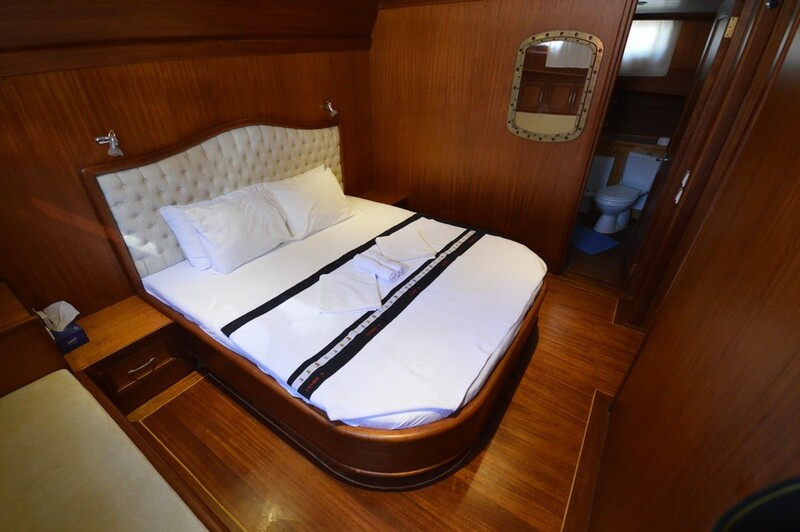 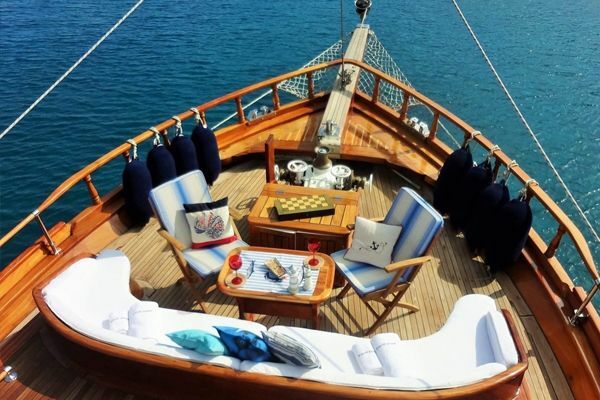 Gulet Cemre 4 is always in great demand for charter by returning guests as the owner of is an original Bodrum gulet captain and with his experienced crew sees to all the guests’ needs in a friendly hospitable manner. 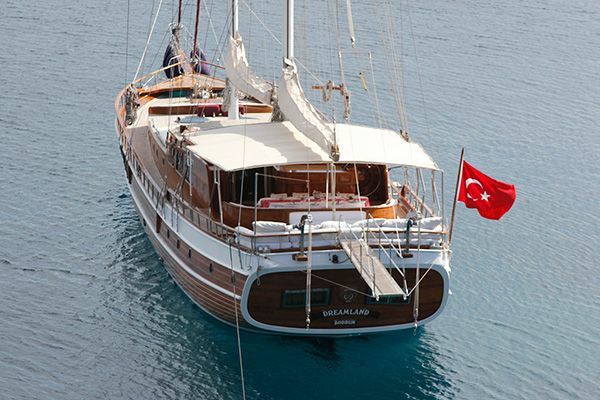 From maintaining the gulet impeccably to making sure all enjoy tranquility and fun aboard, they help guests discover the special bays, the beautiful waters, and the great experience of sailing along the gulet holiday cruising routes of Turkey and Greece.